Are you after a new high quality front door for your home? Garage Doors Direct supplies and installs a wide range of the highest quality steel, aluminum and specialised timber entrance doors for your home; many are even matched to our Garage Doors Range. 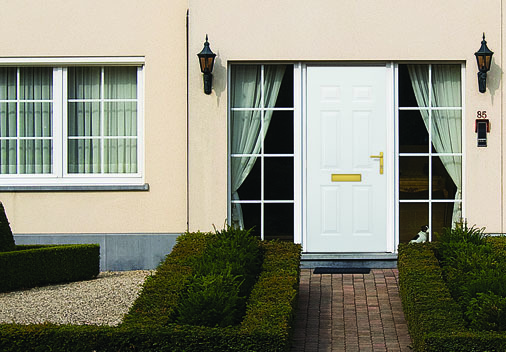 We have doors to suit everyone, such as classic, modern, contemporary, and traditional. We also have doors specifically designed for all the needs you may require, whether you want high quality security to keep you safe, triple glazing and specially sealed to keep you warm and cozy inside or maybe you're just after a stylish and gorgeous front door; we have the door for you. Front Doors are the main object of anyone's first impression of your home. Portray the essence of your home through a stylish and presentable entrance. Using a one of our high quality front entrance doors can increase the image and the value of your home, as our attractive range and great level of security is second to none. Our front door range is not only beautiful on the exterior but flows through to the interior of your home, keeping a detailed perfect finish. Each entrance door we supply is available with an optional made to measure side-glazing elements and top transforms to radiate the beauty, structural elements of your home and to let natural sunlight flow through your home.